S/FJ: IN SWEDEN, WE ARE NECK AND NECK WITH JUSSI BJÖRLING FOR "BABES OF THE YEAR"
IN SWEDEN, WE ARE NECK AND NECK WITH JUSSI BJÖRLING FOR "BABES OF THE YEAR"
You know what I like most about Argentina? The Argentinian version of Rolling Stone. Writers like Oscar Jalil and Pablo Strozza do not come along every day. They come along, like, whenever they have time. 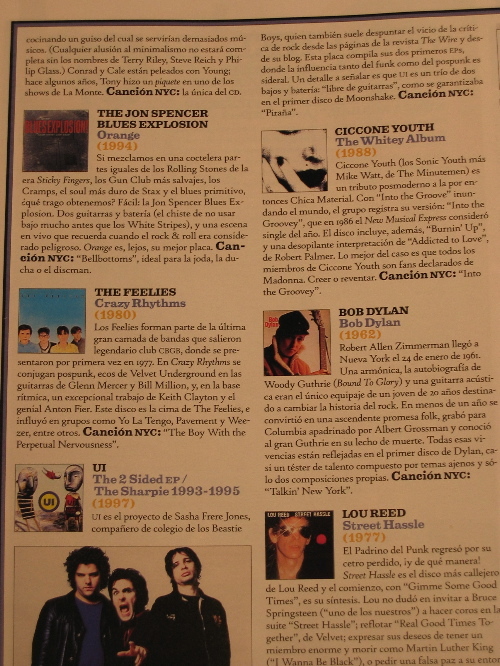 They had the vision to see that the first two Ui EPs (once they were compiled into a single, commercially available CD, solving the singular/plural problem) are one of the "100 Discos Esenciales De Nueva York." That this isn't even remotely true doesn't stop me from being giddy and proud that someone thinks so. You know, if the Fun Lovin' Criminals and Genesis and Anthrax are going to be on here, then we're going to drop the self-deprecation and sit right down where we belong. It's a good list: as well as the usuales suspectos, the list includes the Silver Apples, Richard Lloyd's Alchemy, two Madonna records (though not the debut? which was NY for a year) and Big Science. I also like a rule they allow themselves: albums made in New York by non-New Yorkers qualify. As a result, the list includes Caetano Veloso's Estrangeiro, The Mekons' Mekons...New York, and Nico's Chelsea Girl. A "Canción NYC" is broken out for each album, the one song to rip if you're ripping only one. (CMJ used to do this, and Blender does this now, right?) For Remain In Light, the song chosen is "Crosseyed and Painless." For Ui's The 2-Sided EP, it's "Piñata," of course. That's a Spanish word. Except they print it as "Piraña." That means piranha, not big-papier-mâché-thing-you-hit-with-sticks. "Piñata" is the only Spanish word on the entire CD. Is that odd? Or what? And they don't respect my hyphen, but I can't complain: This is the only time we will ever be on the same page (and with equally large artwork) as The Feelies, Bob Dylan, Lou Reed and the Talking Heads. So they can pick the non-existent song "Azgorondo Pipula" and call me Felix Arroyo-Bumbershoot for all I care. All I know is motherfuckers in Buenos Aires are muy fresca.